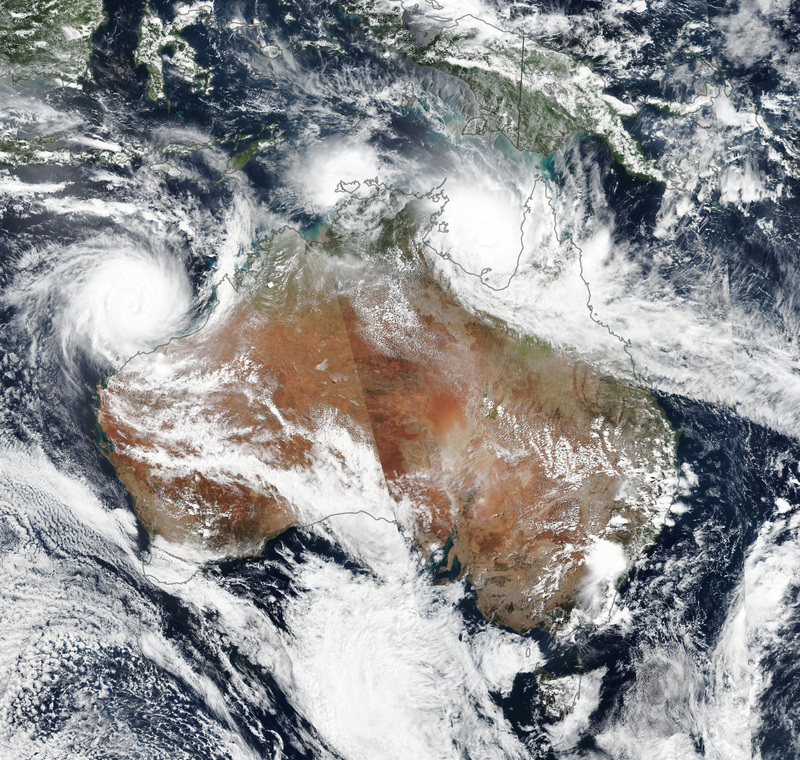 Two severe tropical cyclones bore down on northern Australia at the start of autumn 2019. Cyclone season in the region stretches from November to April, peaking in February and March. 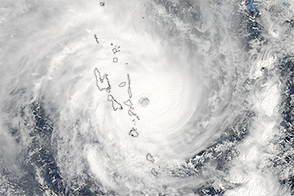 Cyclone Trevor first made landfall on the Cape York Peninsula as a category 3 storm on March 20. 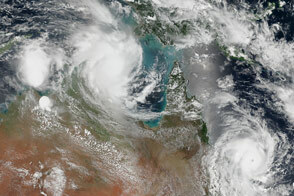 The storm weakened and meandered over land before intensifying again to a category 4 storm over the warm waters of the Gulf of Carpentaria (about 31 degrees Celsius). The government of the Northern Territory declared a state of emergency and launched the largest evacuation in the state since 1974. Trevor is predicted to make landfall again on March 23, bringing intense winds, a storm surge, and widespread rainfall of 100 to 200 millimeters (4 to 8 inches), with some areas seeing up to 300 millimeters (12 inches). Some inland desert areas could see as much rain in a few days as they receive across some entire years. 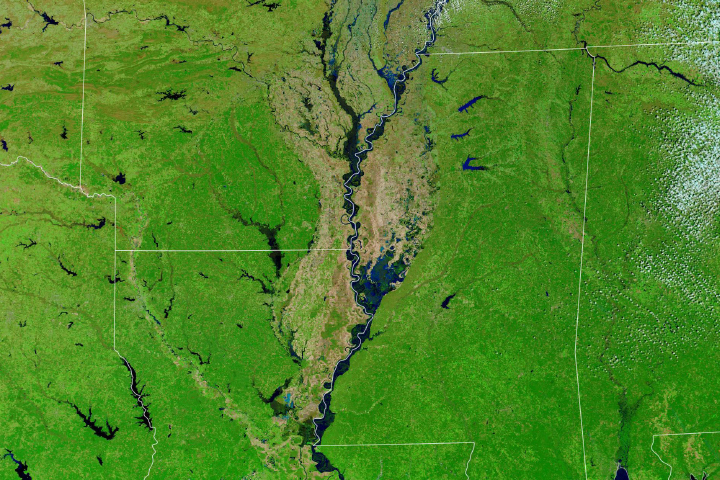 On March 22, 2019, the Visible Infrared Imaging Radiometer Suite (VIIRS) on the Suomi NPP satellite acquired the data to make this composite image. The seam line across Australia marks the edge of two different early afternoon satellite passes over the continent. 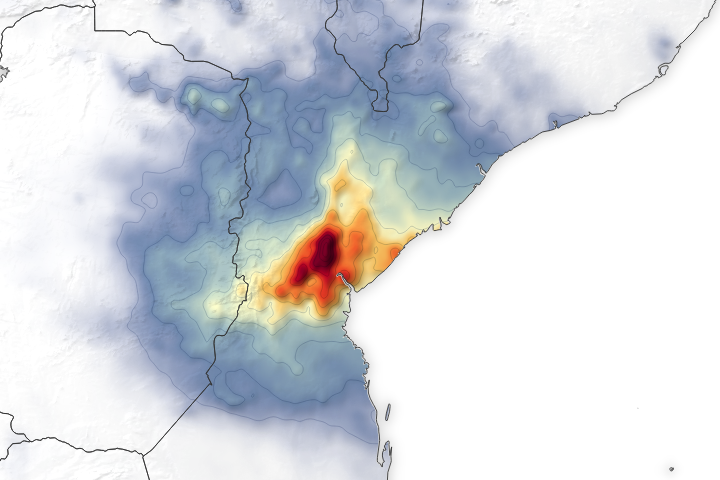 At the time of the image, cyclones Trevor and Veronica both had sustained winds of roughly 175 kilometers (110 miles) per hour. NASA Earth Observatory image by Lauren Dauphin, using VIIRS data from the Suomi National Polar-orbiting Partnership. Story by Mike Carlowicz. Evacuations have been made in Northern Territory as residents brace for fierce winds and flooding rain. 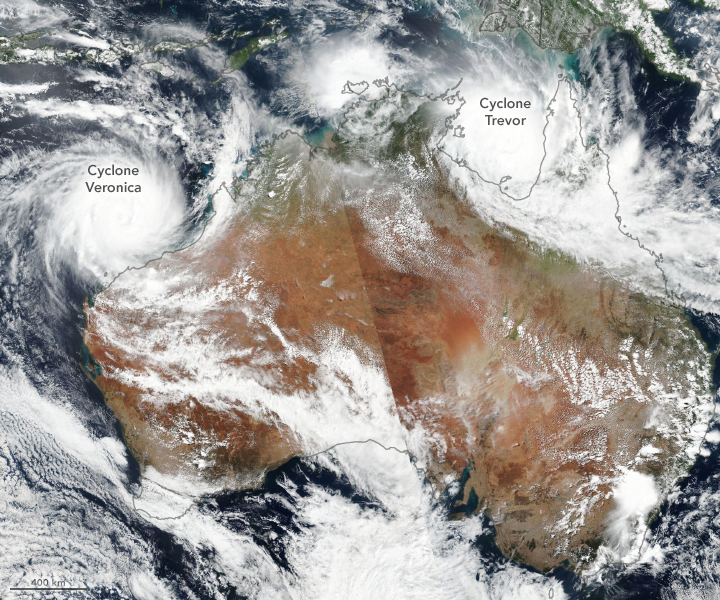 ABC News (2019, March 22) Cyclones Trevor and Veronica loom over northern coasts, stirring up a storm of questions. Accessed March 22, 2019. ABC News (2019, March 21) Cyclone Trevor prompts mass evacuation from NT communities as it heads across Gulf. Accessed March 22, 2019. AccuWeather (2019, March 22) Australia faces a duel severe tropical cyclone strike this weekend starting with Trevor in Northern Territory. Accessed March 22, 2019. Australian Bureau of Meteorology (2019) Tropical Cyclones. Accessed March 22, 2019. U.S. Joint Typhoon Warning Center (2019) Tropical Warnings. Accessed March 22, 2019.